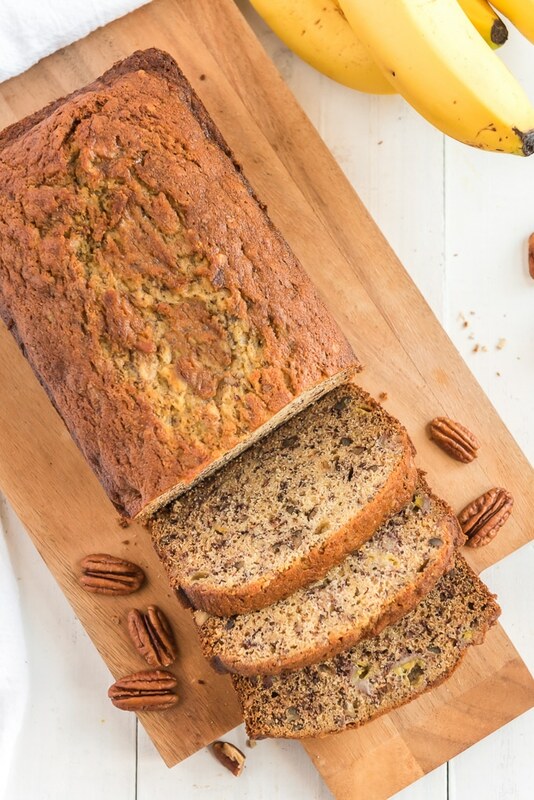 This Banana Nut Bread is a family favorite! 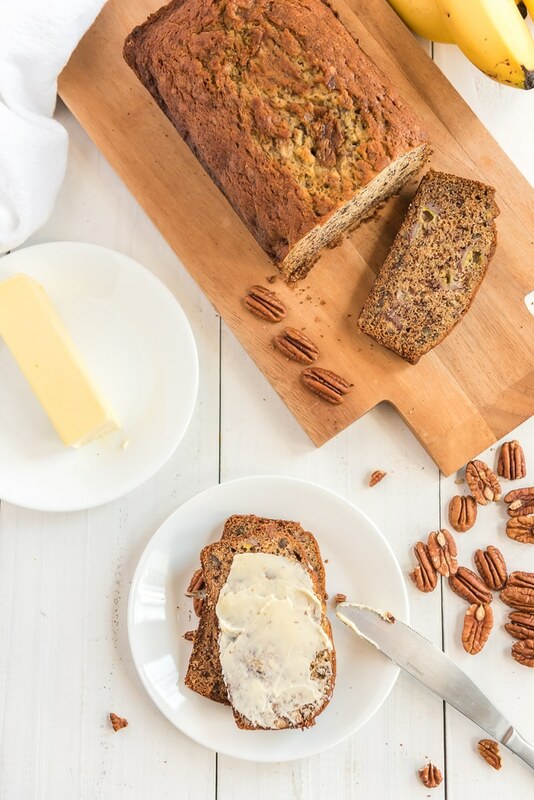 This banana nut bread is so good, you’ll never think of another homemade bread ever again. Seriously, get ready for your taste buds to fall in love. Now, let me just say…I’ve always been a fan of banana nut bread. The flavors, the crunch, the sweetness…but it wasn’t until I created and made this homemade bread recipe that I know I’ve forever spoiled myself. Some people like to have different nuts added into their banana bread while others don’t. And don’t worry, this banana nut bread can be made with, or without nuts. 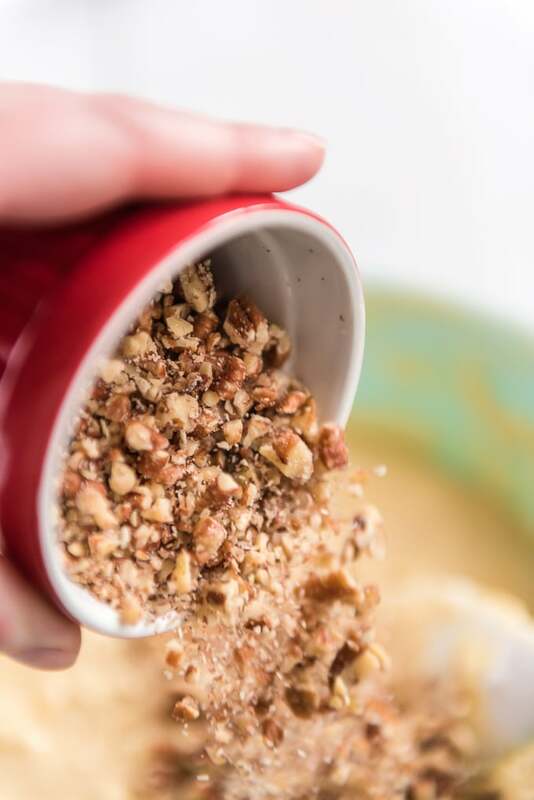 But if you want to add some nuts, you can add in walnuts, almonds, or even pecans. They’re all really, really good. The key to good banana bread? Making certain that you don’t overcook it. 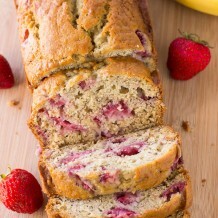 Banana bread should be moist and dense and just really have that flavor and taste linger in your mouth. And trust me, friends, this banana bread recipe does all that and more. Call up your friends, invite them over for a brunch or a cup of coffee and cook up a load of this delicious bread. There’s nothing better than sharing it with your family and friends when it’s hot and fresh out of the oven! ● BUTTER: 1/2 cup (1 stick) unsalted butter. 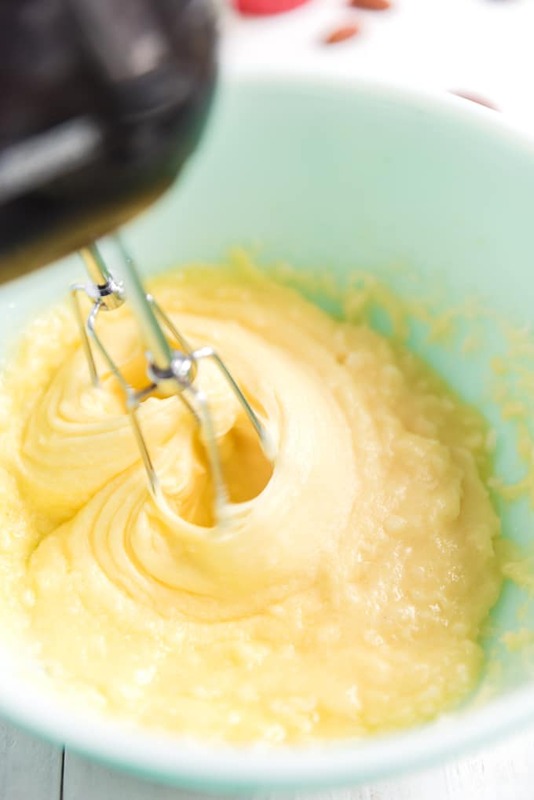 Make sure that your butter is softened before you start baking. I like to set the butter on the kitchen counter for about 1 hour before I begin baking. ● SUGAR: 1 cup granulated sugar. ● EGGS: 2 large eggs. 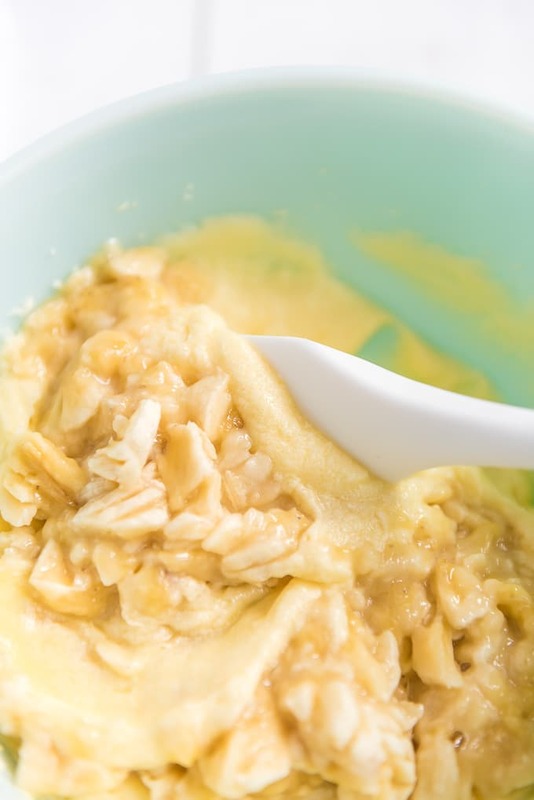 Beat the eggs in a small bowl using a fork. ● BANANAS: 3 ripe (brown) bananas. I like to mash the bananas in the same bowl that I beat the eggs in. I’m all about fewer dishes! ● ALL-PURPOSE FLOUR: 2 cups of all-purpose flour. ● BAKING SODA: 1 teaspoon baking soda. ● PECANS: 1 cup of chopped pecans. PRE-STEP: Preheat oven to 375F degrees. 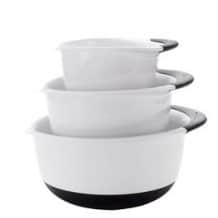 Spray a 9×5 loaf pan with nonstick spray. Set aside. STEP 1: In a large bowl, using a hand or stand mixer cream butter and sugar together until light and fluffy. STEP 3: Using a small bowl, mash bananas. Add mashed bananas to the mixture and combine. STEP 4: Sift all dry ingredients: flour, baking soda, and salt. Slowly add sifted dry ingredients to banana mixture and mix until flour is just combined. Stir in pecans. STEP 5: Pour banana bread mixture into prepared loaf pan and bake at 375F for 15 minutes. REDUCE heat to 350F and bake for an additional 40-45 minutes until edges are slightly brown or until the toothpick inserted into the center comes out clean. STEP 6: Let cool completely before removing from loaf pan. WHY DOES MY BANANA BREAD SINK IN THE MIDDLE? : Want to know the trick to get the big, fluffy top!? Well, it’s easy, all you do is bake the banana bread at 375F for 15 minutes, then reduce the heat to 350F and bake for an additional 30 minutes. DON’T LET THE TOP BURN: Don’t let the top of your bread BURN! About halfway through baking this bread, make sure to check to see if the top of the bread is getting too brown, just place a piece of aluminum foil over the top of bread for the rest of the baking time to avoid burning the top of the bread. CAN I FREEZE BANANA BREAD? : YES!! Banana Nut Bread freezes very well for up to 3 months. When ready to enjoy, place bread in the refrigerator overnight to thaw. Then place the bread on your kitchen countertop for about 30-60 minutes to allow it to come to room temperature before slicing. 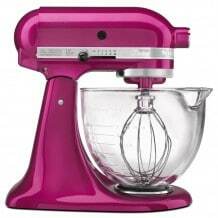 ELECTRIC MIXER: I love my KitchenAid Mixer, I use it for everything. 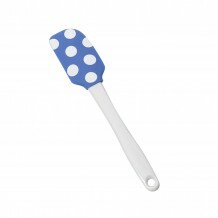 Makes baking so much easier! BREAD LOAF PANS: These are the bread loaf pans that I used to make this banana nut bread. Preheat oven to 375F degrees. Spray a 9x5 loaf pan with nonstick spray. Set aside. 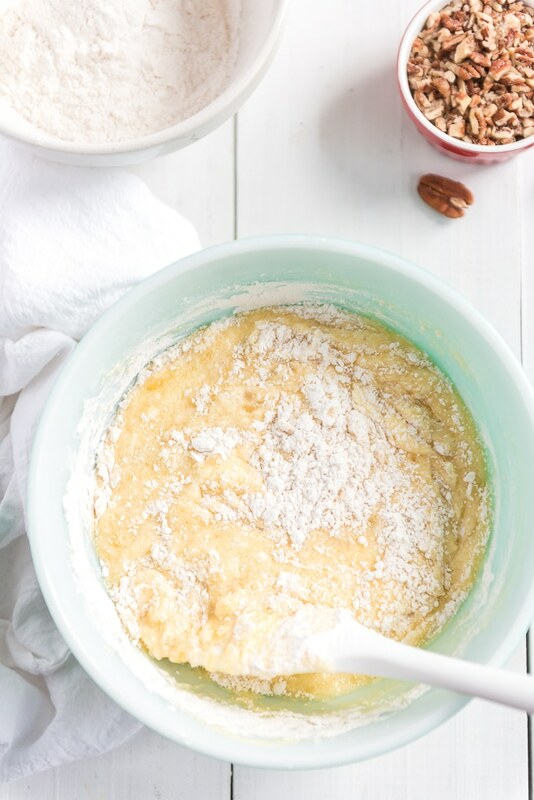 In a large bowl, using a hand or stand mixer cream butter and sugar together until light and fluffy. Using a small bowl, mash bananas. Add mashed bananas to the mixture and combine. Sift all dry ingredients: flour, baking soda, and salt. Slowly add sifted dry ingredients to banana mixture and mix until flour is just combined. Stir in pecans. Pour banana bread mixture into prepared loaf pan and bake at 375F for 15 minutes. REDUCE heat to 350F and bake for an additional 40-45 minutes until edges are slightly brown or until the toothpick inserted into the center comes out clean. Let cool completely before removing from loaf pan. 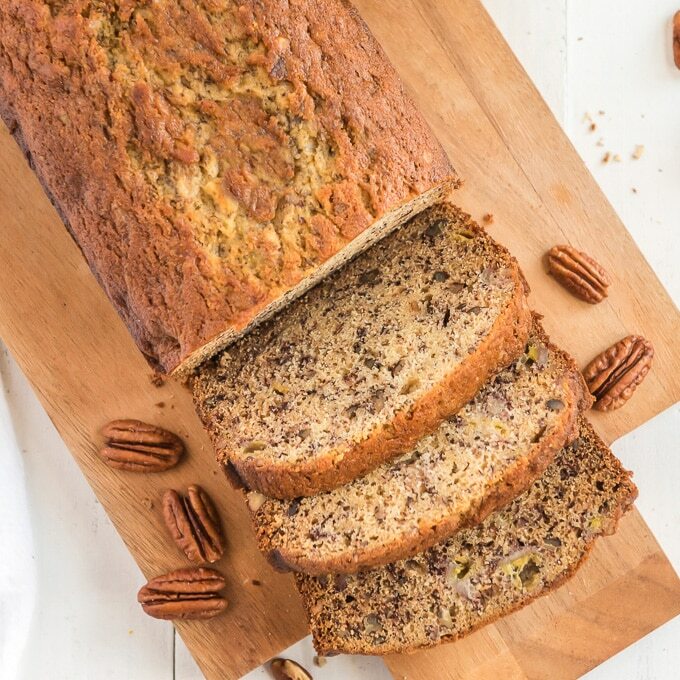 FREEZE: This Banana Nut Bread can be frozen for up to 3 months. 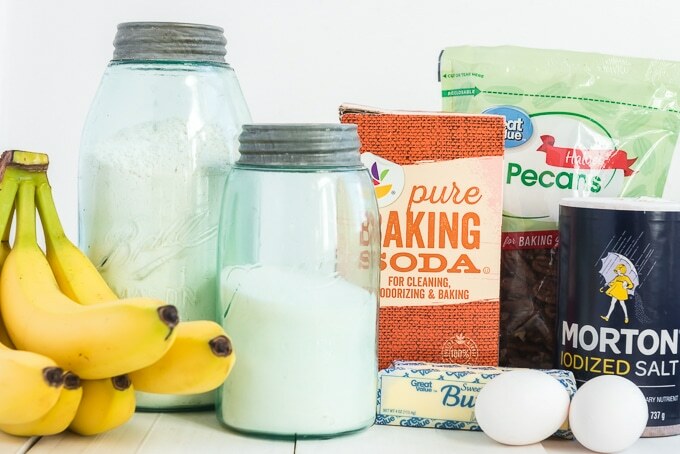 Very intrigued by this banana nut bread recipe! And your easy to follow steps make it so inviting to make! Thanks so much for sharing :). I bought a big bunch of super ripe bananas on discount at the grocery just for banana bread. Coincidence I came across this recipe?? Not at all! I’m obsessed with banana bread. This one looks absolutely amazing. So moist and perfect. I wish for a slice right now. I saved the recipe and will definitely give it a try. We always have extra bananas in the freezer — that’s because we can’t eat them fast enough and they ripen too much. Well, if we put them in a banana bread the bananas are consumed in record time. In fact, my daughter buys extra bananas so that I’ll make their family some goodies. This recipe will be for my extra bananas. This is such a keeper recipe. We loved it!! 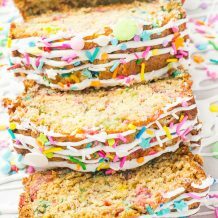 I love banana bread and this one looks super delicious! I also love that it’s chock full of nuts! What a great treat to make all year long! I like that you gave some tips for making the perfect banana bread – I always just thought sinking in the middle was unavoidable! So I will definitely have to try your 2 temperature method. Thank you! I have been scouring the internet for a delicious banana bread recipe and I think this is it! LOVE the step by step process shots. What a great recipe! Mmmm! This looks so tender! I think it would go very well with my a.m. coffee (and again in the afternoon with some tea)! Really nice! I’ve always got some bananas waiting to be used! I love the texture of this banana bread! My favorite breakfast! This looks like the perfect companion for my morning coffee! Yum! 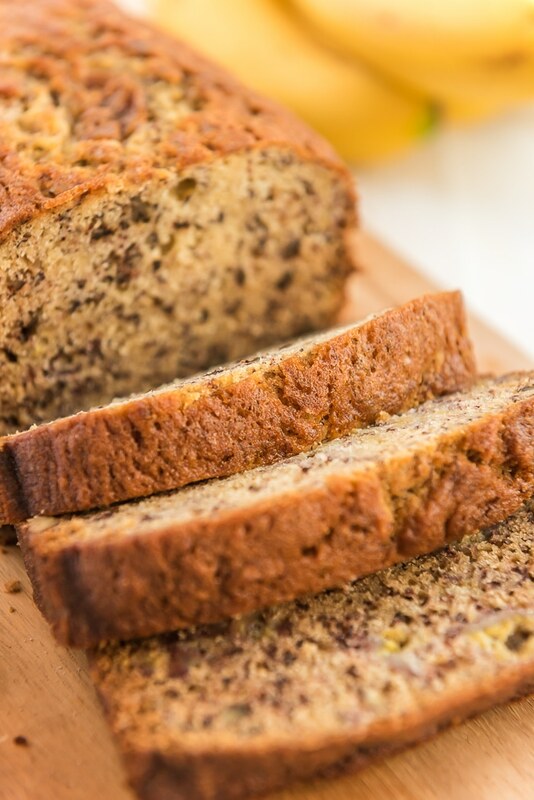 why is it that spring time and banana bread just go together so perfectly!? Can’t wait to try this delicious looking recipe!! 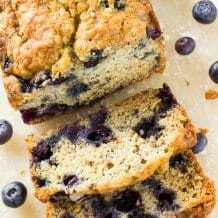 I love banana bread and I am always looking for new recipes. Love that this uses pecans! The best reason to let bananas ripen! I love how easy and delicious this is too make! I love making banana bread when my bananas get too ripe. This recipe never fails me!